The City of Toronto has released a new poster which is being featured on bus stops around the city. The most obvious problem is the depiction of white people as “racist”. This message incites hatred towards European Canadians and reinforces a damaging stereotype. By disseminating this trope of the “racist white person” Toronto is contributing to the message that “racism” is “something that white people do” and thereby pairing “racism” with “white people” in the minds of the public. This is damaging to European people everywhere because it enables others to disguise attacks on white people as attacks on “racism” and it splashes hatred for “racism” onto white people in general. On a deeper level, the third problem is that the posters reinforce the construct of “racism” itself. The term “racism” is a rhetorical weapon which is used, primarily, to oppress and stigmatize political assertiveness on the part of white people and to moralize us into a state of political impotency. For example, in this poster the white person is depicted saying “go back to where you came from” and this is meant to be an example of “racism”. Although presented in a deliberately simplified fashion, his words convey an entirely legitimate political position. This country is a democracy, and simply by being citizens here, people are granted a share of political power over the spaces in which we Europeans live. It is a rational political practice for European Canadians to endeavour to maintain a greater portion of power over the environments where we live by making up a greater percentage of the voting demographic. It is our responsibility to ensure our own well-being as well as that of our progeny and political power is the only thing that enables us to do that. Another point of interest is how the messages of this poster conflict with our state policy of multiculturalism. Multiculturalism is a policy which says that we should maintain our ethnic and cultural identities and continue to view ourselves, and others, not simply as uniform “Canadians”, but as members of groups with unique ethnic, cultural and historical backgrounds. In this poster, the European tells the African Muslim to ‘go back where you came from” and she responds with “Where? North York?” as if she’s oblivious to what people actually mean when they use that expression. The whole project of multiculturalism is to tell people to not forget where we came from, and yet this poster seems to imply that it’s ridiculous and ignorant to suggest that our histories and identities extend beyond our relatively recent time in Canada. Not only is it entirely truthful and accurate to suggest that we are more than just “Canadians”, but that is the very perspective that our government has been encouraging for the past 30 years! It’s interesting that, in explaining the project, campaign spokespersons say that the effort is aimed at helping “racialized communities”. The term “racialized” is Marxist rhetoric which refers to anyone who isn’t white. On top of the fact that this campaign incites hatred towards European Canadians by portraying us as “racist”, if it is also the case that it explicitly excludes certain groups from its scope, then it is guided by a special-interest agenda and shouldn’t be receiving public funding. 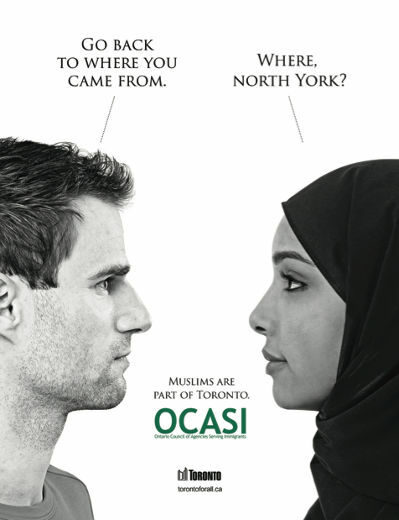 According to their press release, the goal of the campaign is to “create a Toronto that says ‘No’ to all forms of discrimination and racism”, and yet, in light of their anti-white themes and Marxist rhetoric, one can’t help but wonder, how would the team behind this campaign define “racism”? If it were asked of them, “isn’t this campaign ‘racist’ towards white people?”, how would they respond? If, like the Marxists in our universities, they hold that it’s not “racism” if it’s against white people and that “only white people can be racist” then we’re sure the white people who paid the taxes that helped fund this effort would be very interested to hear that. Toronto brands itself as “the most multicultural city in the world” and its identity is rooted in the idea that diversity and multiculturalism are inherently good. The official city motto is “Diversity Our Strength”. And so isn’t it ironic to now see Toronto, the flag-ship city of Canadian multiculturalism, investing its resources in combating inter-ethnic conflict. So which is it, Toronto? Is “diversity our strength” or is it a source of tension, violence and conflict? The final problem is the timing of the posters. Toronto says that the posters are, in part, a response to “a number of crimes committed against Muslims earlier this year”. As evidence of said crimes, CityNews links to story of a Muslim woman who was pushed and called a “terrorist”—in November 2015—by a black male! But, just three days before the campaign’s launch, a Muslim committed the largest mass shooting in the history of the United States. On the heels of this landmark massacre, why are white people the ones being condescendingly thought-policed? If Toronto is concerned about inter-ethnic conflict, then aren’t Islamic bullets a bigger problem than white words? Isn’t getting murdered a more serious concern than being told to “go back where you came from”? Muslims kill us and then Toronto tells us that we’re the problem? This poster is an insult. As the forces of globalization continue to create the demographic pressures which are turning European peoples into minorities in the spaces where we have lived for generations, expressions of hostility and hatred towards us will become of greater and greater significance. In this context of anti-white hostility and demographic weakness on the part of Europeans, it is important that we have institutions to study and identify our interests and advocate on our behalf. This is why Students for Western Civilisation exists, and this is why we need a #whitestudentsunion.